I mean, take all of anime-dom, which is already a vast and mighty throng. Now take every single weapon, every piece of armor, every bit of gear. It’s a very, very big number. Many share overwhelming commonalities, such that distinguishing between one and the other is a fruitless endeavor. And that turned out to be my saving grace. I dismissed everything common, all the everyday things that are just like all the rest. Weapons of either pure evil or pure good or some such were also discounted, as that is a trope in and of itself. Things that were just different versions of the same thing, such as mecha or artificial limbs, also gone. So, no automail from Fullmetal Alchemist (sorry!). It couldn’t just conform to stereotypes, either, like the switchable armor for the Lyger in Zoids, catering to speed, strength, and sharp things. It needed to be a real part of the story, not some vague thing in the background. It needed to be something we can all understand, though it could certainly remain fantastic, so the “Imperial Arms” of Akane Kills are also out. It needed to be something more than just “an object.” Like it had to be part of a character, part of their personality, part of their strengths. And, of course, the most useful things – and it did need to be useful – are versatile. I like creativity and adaptability, because it proves the character who uses it isn’t just some stupid hack’n’slash idiot, getting by entirely by luck. With all of that criteria now rolling around in my mind, most of the many, many, many candidates were swept away, and my obvious choice rose from their midst. Ok, I might be cheating just a little bit. 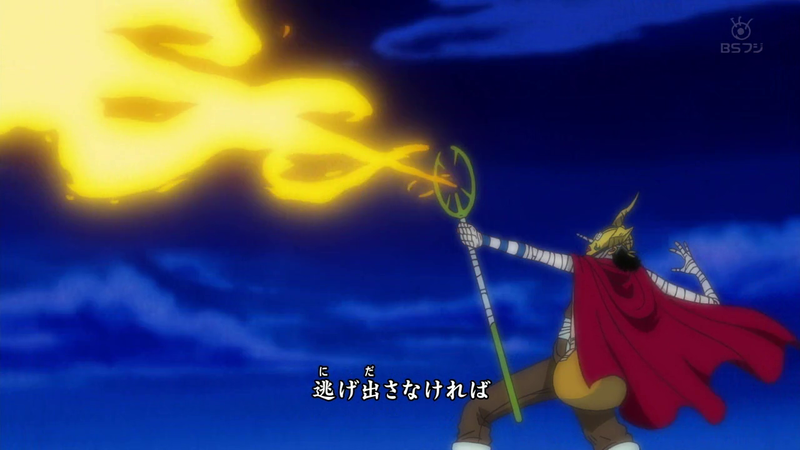 I mean, Usopp’s wacky arsenal is, technically, more than one item, including but not limited to weapons. But it is all Usopp’s personal weaponry and tools, carried around in one good-sized bag. It’s his gear. Usopp’s arsenal is definitely not normal and everyday. It may include a hammer and a rubber band (of doom), but it also includes seeds which sprout into gigantic plants. It’s not some “pure good/evil” thing, and it’s not some elemental force either. Usopp’s tools and weapons are really just a collection of items, ranging from the mundane to the fantastic, which Usopp collects and uses throughout his journeys, and he can use them however he will. ONE example of the gigantic plants. Obviously, his bag of tricks doesn’t conform to the stereotypes, though a number of his tools center around his skills as a sniper, such as his sniper goggles, his slingshot, and the various things he shoots. It’s certainly a part of the story, as Usopp’s contributions often center around how he uses his tools, and the plot helps him craft a greater and greater arsenal as time goes on. It’s definitely a part of his character, tailored to his strengths as a sniper and a wily fighter. Usopp is constantly developing and improving his tricks, pouring his heart and soul into them. Even more, as his character evolves, so do they. There’s even a scene where he has been reduced as far as can be done short of outright killing him, and all of his things fall from the bag into a ravenous abyss below. He is left with nothing and has to rebuild from scratch. And he comes back with an even wackier arsenal than before! Finally, I can’t say enough about how adaptable he is, and how versatile his gear is. Some people get by on brute strength, some by luck, but Usopp gets by on his wits. 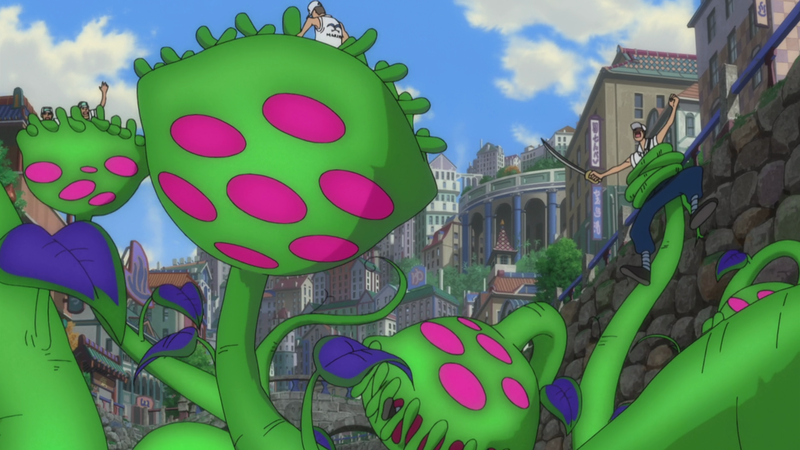 One of the earlier opponents we see Usopp face is a fishman, far stronger than him, and possessing deadly skills. How does Usopp overcome him? Well, he soaks the fishman in alcohol, and sets him on fire. 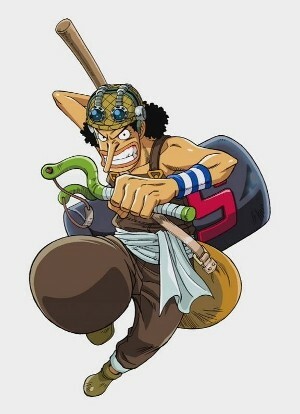 As the fishman runs for the nearest body of water, Usopp catches up to him and pounds him on the head with his hammer! Thus, the fishman is rendered unconscious, but still alive in the water. And Usopp stands triumphant! Awhile later, Usopp has expanded his toolkit to include some special sea shells. What makes them special is how they can store things to be used for later. Some spurt fire, some blow air, others record sounds to play back, and one absorbs kinetic energy. They think to use that latter one to blow the door off a cage, but they accidentally bring out a sea shell that stores smells instead. And as Luffy stored fart in it as a practical joke, they fill the chamber with methane instead, which is ignited by the lanterns. Boom! And instead of blowing the door from the cage, they blow the stone from around the bars. Later again, Usopp faces off against Luffy, as the two friends are having the most heated argument they will ever have. (I hope) Usopp is utterly outclassed. By rights, Luffy should pound him into the ground without breaking a sweat. But Usopp uses everything from exploding bullets to rotten eggs to even the odds, and puts up a very good fight. Did I mention the fireballs? Even later, with a souped-up slingshot, Usopp launches a long-distance sniper attack, raining exploding bullets down on navy soldiers and their corrupt commander, buying precious time for his comrades to close the distance and rescue a friend. Much later than that, in a fairly recent story arch, Usopp has his new slingshot, which has a ravenous plant at it’s center, eat up several chunks of rubble. He then shoots this miniature rock field into the sky, to barrage a flying opponent, bringing them down. Oh, and a whirling set of manacles to wrap around the antagonist, capturing them. And that’s just what he does on a strictly-offensive scale. He also has a belt that launches a rope and grappling hook, octopus boots that let him walk on walls and ceilings, ketchup to fake injuries with, hot spices which give Luffy a hilarious object lesson in not stealing his food, and a number of other toys for his mischief. Oh, and he built Nami’s first two Clima Takt staffs, setting her on her path of calling down lightning on their enemies. In short, Usopp arsenal is reflective of his personality, such as his ability to see the value of things others take for granted. He’s quick and wily, though also a bit of a coward. He usually tells over the top lies, but he’s also good at deceiving and tricking his enemies at crucial moments. He can adapt, he can build, he’s a skilled sniper, and he thinks outside the box. So my favorite gear is definitely his wacky bag of tricks. This entry was posted in 30-Day Anime Challenge, Anime and Cartoons, Challenge Accepted and tagged One Piece, Usopp, Usopp's arenal, Usopp's bag of tricks. Bookmark the permalink.